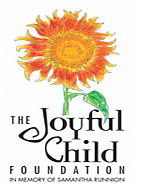 With ardent support of the Surviving Parents Coalition, The Joyful Child Foundation and radKIDS, Inc. are partnering to establish a comprehensive approach to prevention education, called Not One More Child that combines The Joyful Child's Ambassadors Training for adults with the radKIDS Personal Empowerment Safety Education Program and Life Skills for Children. "NOT ONE MORE CHILD" is the first prevention education initiative endorsed by the Surviving Parents Coalition (SPC). Download printable information on Not One More Child/Education by clicking here. The radKIDS Educational Model is a unique hands-on developmental program that empowers and provides realistic options and skills for your children to recognize, avoid, resist and if necessary escape predatory violence. Is it not time to teach/train our children to do what we want them to do if faced with danger or victimization instead of just telling them what we hope that they’ll do? Click here to learn more about radKIDS. There is only one activity based empowerment and safety skill building curriculum in the nation that can and does do that, so why are we not teaching radKIDS to our children? Bring radKIDS to your community. can change the world. Indeed, it is the only thing that ever has." and YOU can be that individual by building a team of radKIDS Instructors to provide this potentially lifesaving skills to your community. (1) Can we guarantee the safety of our children in this school and community today? (2) So why are we not teaching them to be safer and to be able to respond to our greatest fears? (1) Can you guarantee the protection of the children in this community? (2) Then why are we not teaching them how to be safe and to escape violence and harm? (3) Would you rather see a child who gets trapped by someone trying to hurt them with an attitude of, "How dare you touch me!" or one of "Help Me Help Me" Well then why are we not teaching them what they deserve and may need to know? After reviewing these materials please email us (click) directly for additional helpful information on Bringing radKIDS Instructor training to your community. Together we can and will make a difference one child at a time.